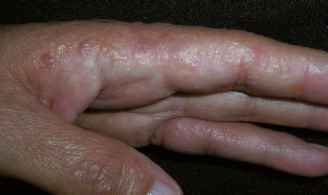 • Contact dermatitis is classified as irritant (ICD) or allergic (ACD). • Clinical findings of ICD and ACD can be identical, and both entities can be present simultaneously. • Nickel is the most common cause of ACD. 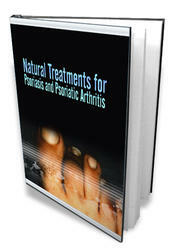 • Avoidance of irritating substances or environments and allergens is key to therapy. Dry-skin care and topical corticosteroids are also helpful. • Referral for patch testing can help identify the causative agent in ACD. Contact dermatitis may be classified by cause into two subgroups: irritant contact dermatitis (ICD) and allergic contact dermatitis (ACD). ICD occurs when the skin is exposed to an environment or substance in a sufficient frequency, quantity, or duration that it overcomes the barrier function of the skin. Therefore, given adequate exposure, anyone may experience ICD. ACD is a delayed-type hypersensitivity (type 4) reaction to a topical agent and requires initial contact with a substance causing a T helper cell type 2 (Th2)-mediated immune response in a predisposed individual. Only with repeated exposure do the primed T cells cause the clinical response of dermatitis. Findings of contact dermatitis can include erythema, vesicles, bullae, exudation, and crusting from breaking of blisters, swelling, and scaling. Common areas affected are the hands, neck, eyelids, face, genitalia, and legs. ICD and ACD can look identical and can present on similar body areas. Both may be intensely pruritic, further complicating the diagnosis. In addition, ACD and ICD can be present simultaneously, as with the health care worker allergic to latex who washes the hands repeatedly throughout the day. A careful history and patch testing are often the key to diagnosis. Each year, millions of patients develop an allergic rash after contact with poison ivy, poison sumac, or poison oak, and contrary to popular belief, the fluid within these vesicles does not cause poison ivy "to spread." Nickel is the most common nonplant cause of ACD and historically more common in women because of costume jewelry and ear piercing (Fig. 33-30). With the increased popularity of jewelry and body piercing, the prevalence is rising in men. The 10 top causes of ACD in North America are nickel, neomycin, balsam of Peru (common fragrance), fragrance mix, thimerosal (preservative no longer used in vaccines but still found in eye preparations), sodium gold thiosulfate, quaternium-15 (preservative), formaldehyde (preservative), bacitracin, and cobalt (metal often in conjunction with nickel in silver-colored jewelry). In the workplace, ACD is very common. For skin conditions, 90% of workers' compensation claims result from contact dermatitis. Common offenders in specific occupations are rubber or latex in health care workers, hair and clothing dyes in hairdressers, chromates in cement workers, and the Rhus family (poison ivy, oak, and sumac) in agricultural workers. ICD most often develops in response to excessive exposure to soaps, cleansers, hand sanitizers, and water. Therefore the primary treatment is avoidance of these irritating substances, application of a barrier ointment such as petrolatum, and protective equipment such as gloves. For ACD caused by plants, the skin and clothes with soap and water should be thoroughly washed as soon as possible to minimize exposure to the antigen. Cool, wet soaks for 10 to 15 minutes may be soothing. Superpotent topical steroids, such as clobetasol propionate or betametha-sone dipropionate applied twice daily for 1 to 2 weeks, are effective for treating small areas of moderate ACD. Systemic steroids are reserved for severe episodes of and should be continued for at least 2 weeks to prevent rebound dermatitis. 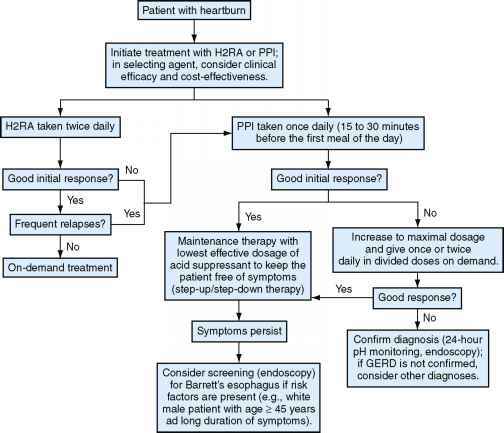 In otherwise healthy persons, a tapering dose of prednisone is not required for short courses of systemic therapy. Severe pruritus may respond to antihistamines such as hydroxy-zine, diphenhydramine, or a nonsedating H2 blocker such as loratadine, cetirizine, or fexofenadine. If ACD is suspected based on history, consultation for patch testing with a dermatologist can be customized to the patient's occupation or hobbies. Once the offending agent is identified, avoidance is crucial. When the offending agent is occupational, a change in jobs may be required. Alternative protective equipment can be sufficient in other cases, such as substituting nitrile gloves for latex. Generalized dry-skin care, topical steroids, or immunomodulators (pimecrolimus, tacrolimus) can help prevent recurrence and treat flares. Figure 33-31 Dyshidrotic eczema with tapioca vesicles (pompholyx).